(Nanowerk Spotlight) 'Smart' windows, or smart glass, refers to glass technology that includes electrochromic devices, suspended particle devices, micro-blinds and liquid crystal devices. Their major feature is that they can control the amount of light passing through the glass and increase energy efficiency of the room by reducing costs for heating or air-conditioning. In the case of self-powered smart windows the glass even generates the energy needed to electrically switch its transparency. A new type of smart window proposed by researchers in The Netherlands makes use of a luminescent dye-doped liquid-crystal solution sandwiched in between electrically conductive plates as an energy-generating window. 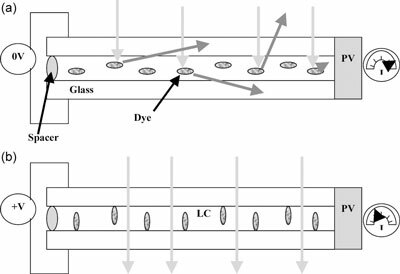 The dye absorbs a variable amount of light depending on its orientation, and re-emits this light, of which a significant fraction is trapped by total internal reflection at the glass/air interface. Using the glass panels as a waveguide, one could transfer the light to the edges where an attached solar cell converts the light to electricity. Light emission is obtained for both on and off states, with the maximal light output corresponding to the state of minimal power consumption by the device. A benefit of these devices is that at zero applied voltage, the transparency is at a minimum, and the edge emission is at a maximum. This state would be most useful when maximal shading is desired, normally corresponding to the brightest part of the day. Thus, the system may perform at maximum electrical generation when the source light is also at maximum intensity, and at zero power consumption. Describing this approach in a recent issue of Advanced Functional Materials ("Solar Energy Collectors with Tunable Transmission"), Michael G. Debije, a senior researcher in the Polymer Technology group at Eindhoven University of Technology, describes a promising first step in an energy-generating smart window system. "This presents a design for a novel smart window using a host/guest system of fluorescent dye in liquid crystals that is capable of variably controlling the absorption of incident light while generating electricity using the same layer" says Debije. "The absorption is adjusted by reorienting the liquid crystals and fluorescent guest molecules via application of an electric field." Energy and cost analysis has shown that the shading of the interior beyond the window can have a dramatic effect on the costs of cooling of a building (see: "Energy and cost analysis of semi-transparent photovoltaic in office buildings"). Debije explains that the fluorescent molecules emit a significant fraction of their absorbed light, a portion of which becomes trapped by total internal reflection in the panels of the window, which act as the waveguide. "This trapped light is then transported to one or more edges of the window where a photovoltaic set in the window frame could be illuminated and provide for the generation of electricity. In effect, the window acts as a solar energy collector, effectively combining luminescent solar concentrator (LSC) and liquid crystal display (LCD) technology." The novelty of Debije's approach is to use the absorption of fluorescent dyes to act as the control mechanism for light transmission. In contrast, the problem with existing smart window systems is the inflexibility in the transmission of the window, which cannot be varied by the user. He points out that transmission is not the only variable to consider in choosing dyes. "The perceived color of transmitted light is an important aspect of a window, as it has been shown that ambient light coloration can affect the behavior and mood of people exposed to the light. Continued research into both the dye guests and the liquid-crystal hosts are necessary to achieve both a more convivial color as well as also allow the harvesting of a greater fraction of the incoming solar spectrum as discussed above, and should increase light emission from the edge of the window." Debije concludes that the liquid-crystal-based 'tunable' window he suggests could provide numerous advantages over other smart window configurations, which either cannot generate electricity or cannot be adjusted for transmission. "The fluorescent guest/liquid-crystal-host-based windows may be selectively tuned for control of the light intensity allowed into a room, and could provide a source for energy generation, both of which could reduce the strain on maintaining a workable atmosphere in the built environment. The production of the devices would be based on already established technology used in polymer-dispersed liquid-crystal windows, and only simple modifications are necessary to convert these into electrical generating devices."